A great new year just deserves tons of great new deals. 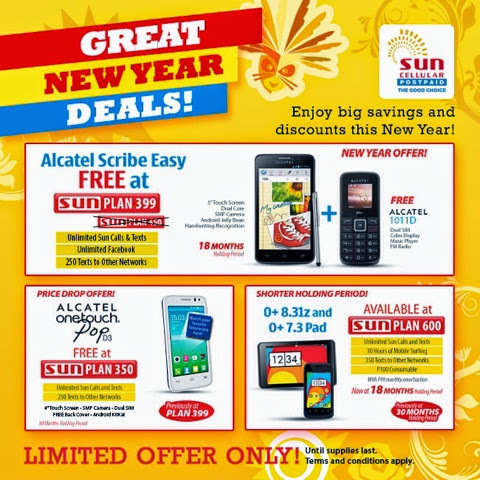 That's what Sun Cellular is exactly going to give you this 2015 as they bring unbelievable plans and freebies on even LOWER rates and... even SHORTER holding periods. Is that even possible? Of course, if you want something done, you just have to be with the GOOD CHOICE. First, meet the Alcatel Scribe Easy. At a limited time, they're offering this plan on a huge price drop. What's a price drop? 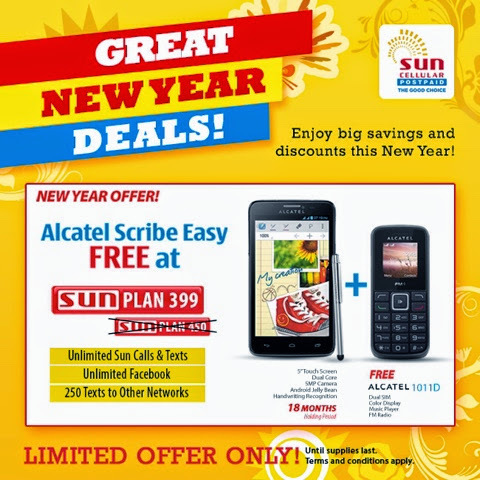 A price drop means that the original Plan 450 for the Alcatel Scribe Easy is now available at Sun Plan 399. Aside from that, they're throwing in an even shorter holding period from the previous 30 months, the Alcatel Scribe Easy plan is now available for 18 months holding period. If that ain't crazy, they're throwing in a FREEBIE. A brand new spanking FREE Alcatel 10.11d with it. Plus, there's no incremental line subscription required. If that ain't enough, they've got more! There's more than one of these great phones on their shelves. They're offering the Alcatel Pop D3 in a much cheaper price too, just tons of savings! 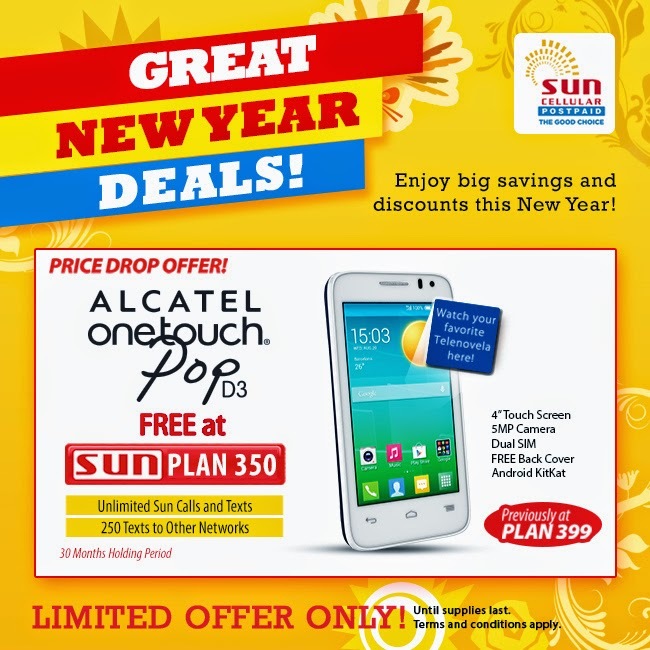 Imagine, from the original Plan 399, the new Alcatel Pop D3 is now available at Sun Plan 350. Aside from that, they're also offering it under a 30 month holding period. It's so affordable, pretty good for students and kids who just want to have their first Android phone. Isn't that nice? I know! Well there's more! If you want two or more family members to benefit from your plan, why not take the O+ 8.31z + O+ Pad 7.3 bundle. They're putting in a shorter holding period offer so you don't have to worry anymore. Better call and text plans, even those for other networks. 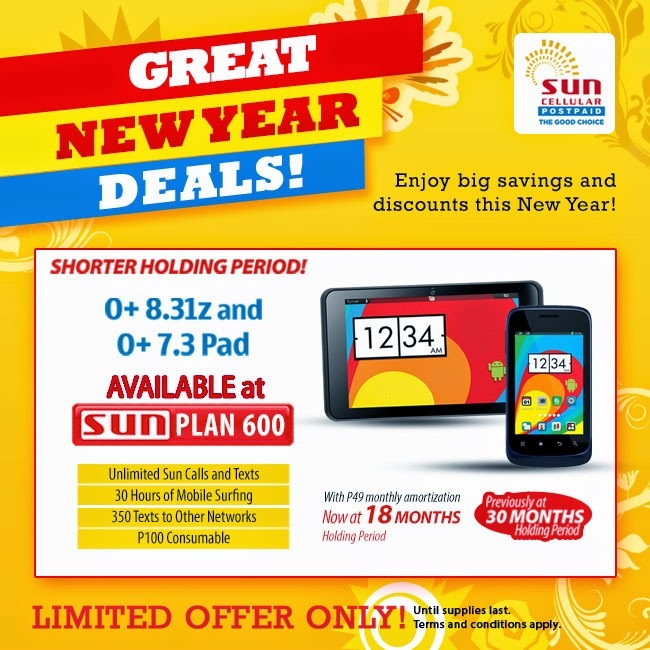 This bundle was originally offered under a 30 month holding plan but now, you can get the O+ Sun Bundle (that includes O+ 8.31z + O+ Pad 7.3) at Sun Plan 600 + P49 as amortization under a short 18 month holding plan instead. You can give the phone to your son, you can give the tablet to your daughter. They really think of your family when packing things together. I love that part. If you want to learn more, you can check out Sun Cellular's website here. Now, there's no more excuse why you shouldn't have Sun Cellular as your line of choice. Why settle for less when you can have more free stuff in a shorter amount of time. It's all given to you by the good choice in mobile networks, that's Sun Cellular! Hurry and order via their Sun Online Store here!